The following is from the final chapter, Reminiscences, of John We Hardly Knew Ye, Memories of John F. Kennedy, by Kenny O’Donnell, David Powers and Joe McCarthy. About Walter Heller. 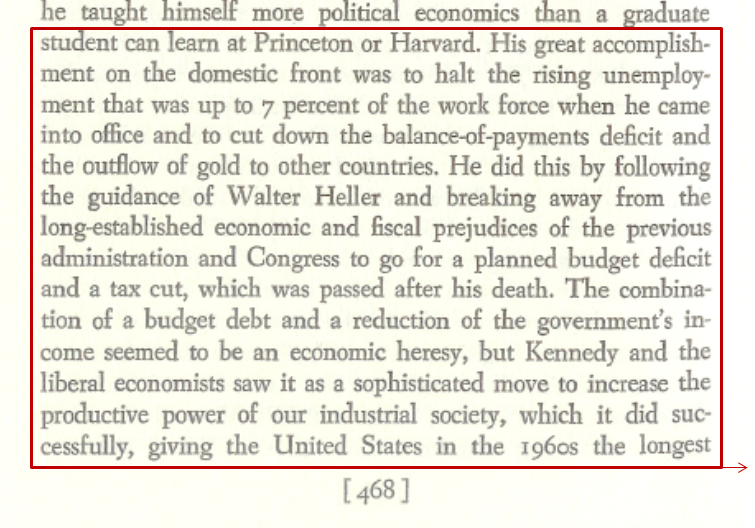 It should be noted that while Kennedy’s efforts in economic strengthening were guided largely by Heller and were largely successful, Heller was at the same time an economic philosophy opponent of Milton Friedman. Watch this interesting interview of Friedman by William F. Buckley on his program, Firing Line. Here’s a fascinating item, President Kennedy’s speech, “The President and the Press“. This is a condensed version. Listen and consider. Go here to the JFK library audio collection for the full version. This first image is entitled The Habit of Return. 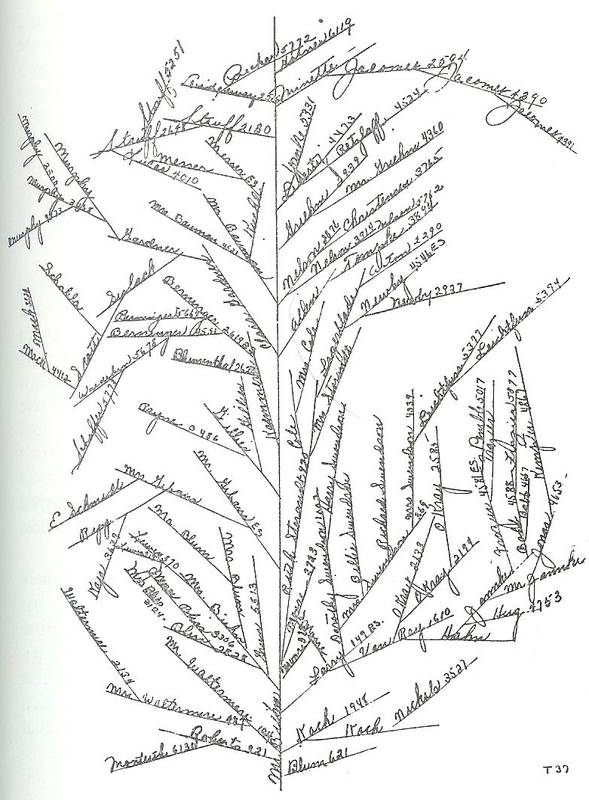 It is a family tree of sorts. The book in which it is found in fact describes it just that way. Its origin is with a single person, and in this example, with a case number assigned. It is almost 70 years old. Today, we describe this in terms of how a business can grow through referrals. I believe the single most important aspect of referrals – the thing that defines the word referral – is relationship. Personal relationships. It literally blooms with one connection – or most importantly for the point – a single referral. A single relationship. If we are honest and sincere, provide a desired and quality product, work with integrity, dedication and commitment, and place the needs of others – including our clients – before our own personal goals, focusing on our mission, we will likely be highly successful. And happy in what we do and more importantly – why we do it. And sure, success may be defined in part to include financial success, but there is more to life than just money. Lord sakes, I don’t want to talk about money. If that’s all you want, go read somebody else’s jibber-jabber. This is about life. 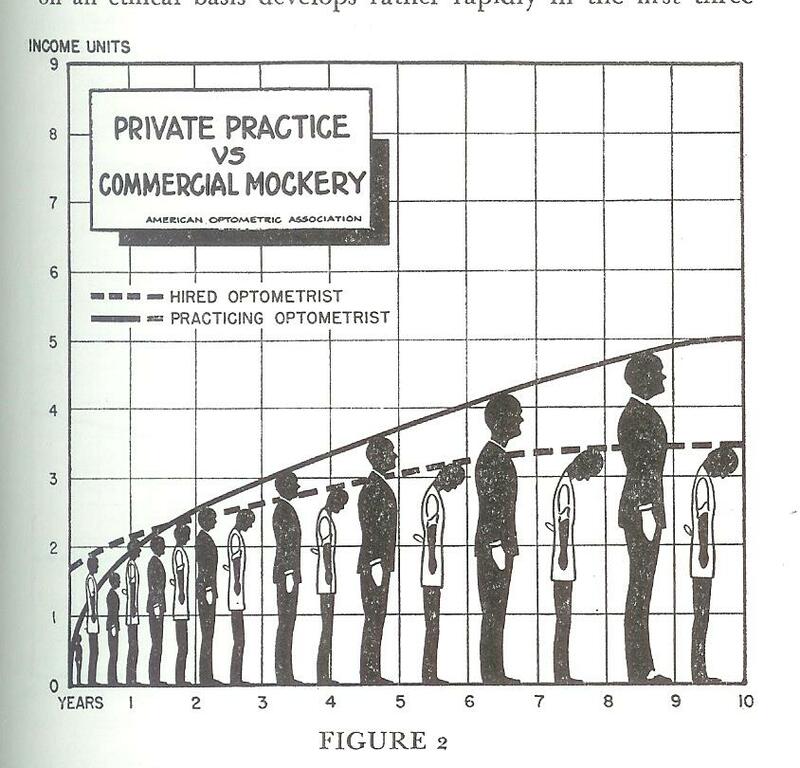 This image, and the one below are from How to Succeed in Optometry, by Ralph Barstow, Illinois College of Optometry Press, 1948, a book once owned by my father and grandfather, both optometrists in private practice – and so, independent businessmen. I continue to consider how this might translate to the efforts, trials and rewards associated with the risks that small business creators and owners face even today. Yes, I am happy to be self-employed, like my father and grandfather before me. I recently heard a radio ad from a local home repair and improvement provider, a business that bears a family name, but which now advertises that (paraphrased] “we don’t use subcontractors; we hire employees.” This was apparently designed to not only instill confidence in potential customers – a good thing, but also to effectively denigrate subcontractors – a bad thing; to disqualify the “farming out” or subcontracting of particular jobs dependent upon specific areas of expertise. I take issue with this tactic, especially in light if the fact this very business themselves began small. Just like the many millions of small, independent contractors – subcontractors – that make up the vast majority of businesses in the United States. This is the very thing – the very ambitious activity that made and still makes our country great, even exceptional. The truth is, contractors, subcontractors – very small businesses – are what make it all work. They are the ones who make it happen and get it done. Every day. Sure, it’s just a marketing scheme on their part. But what a poorly executed, hurtful and selfish – and FORGETFUL – and so, shameful act of betrayal to all they really know. Small business – which that company still is, after all – is what makes our economy go, and what makes the world go round. I will never apologize for being or using a small, independent business or contractor. If anyone asks what really makes our economy work, and what makes our families and towns and our individual pride and expertise and productivity soar, you can tell them: Small Business. And yes, that means independent contractors. The Little Guy. Go Little Guy, go. Stretch. Take a risk. Grow, build and become. And as for the rest of us, let’s hire them. Here’s a brief list of just a handful of people I know – Hoosiers – who took a risk, stretched out on their own, chose to become independent business creators and owners, and in the process, have made important contributions to their hometowns and the world. * …who tried college, found it wasn’t a good fit, went into construction building swimming pools, then eventually created his own custom building business as a carpenter. Is now a well-known, respected and sought-after contractor-builder. * …who started college far from home; even had a golf scholarship, but wasn’t ready. Went back home to try his hand in several businesses, eventually went back to college when he was really ready, and now owns a very successful business meeting needs and solving problems for his clients and taking care of his family – everyday. * …who worked at my grandparent’s farm as a laborer, alongside me, cutting grass, raking, painting, cleaning, well into adulthood when he was struggling with health and financial issues and trying to find his place in life (and always with a wonderfully positive and thankful attitude and great smile). Finally found his niche as a bar and restaurant manager, and then a restaurant owner. He became one of the best known and highly respected restaurateurs with multiple successful ventures, and more importantly – loved and respected by thousands. He is gone now, but his businesses from hard work, dedication and many other virtues, remain. * …who was the brother of the previous guy. He went off to college and went away to the “big city” where he created a great career in the financial industry. Like another, above, he could have taken his talent, money and experience and gone anywhere. Instead, he went home. He picked up where his brother left off, invested, even bought an historic property and brought it back to usefulness and prominence. He has made a huge impact in his community. * …Actually several women and men who have struck out on their own to become specialty bakery owners, specialty clothing shop owners, bookshop owners, apartment building owners and property managers. 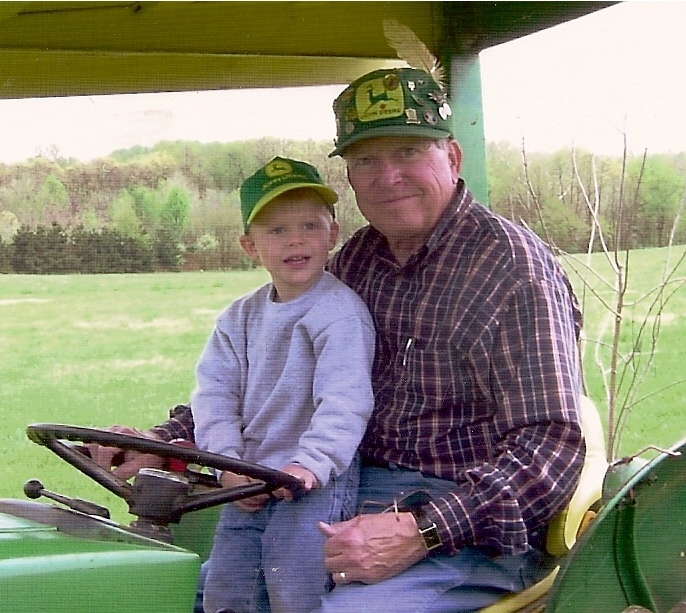 I know a gentleman who chose to leave a private medical practice and purchase a farm implement business. * … who either could not or chose not to go to college; perhaps never even considered it. Started his own trucking business. He now has a fleet of trucks and employees. But more importantly, remains married to his high school sweetheart, has a solid family, and enjoys the security and confidence a strong business can bring. * … who started out by working as a dental technician – making dentures. (Apologies… no doubt I have terminology wrong). Eventually struck out to start his own practice. Enjoyed it – very important – and worked hard enough and smart enough for long enough that he could sell it and retire early. He spends most of his time now close to his two grown daughters and his grandchildren. * … who could have chosen to teach English like his father. Could have moved away like his siblings. Was – is – bright enough to be surgeon if he had wanted that. But chose law school, then to heap stress to challenge, returned to his home town to start his own practice. He is successful, practicing with his wife, and spends more time talking about enjoying family and the outdoors life and running – things he has loved since a boy, and I have been privileged and blessed to enjoy those latter two indulgences with him for nearly forty years. * …several guys who have really stuck their necks out and headed for Nashville. They write music, play, tour and record, and have done it professionally for many years, and have found real success. Maybe most importantly, they have found their own personal niche in life. … And these are just a very few – all Hoosiers, by the way – I happen to know personally. And I haven’t even mentioned so many we all know in farming – the independent businesses owner-operators who feed us. Look around everywhere and see personal names on businesses. Notice the small building that has housed a machine shop or repair service or service provider. That means something both extraordinary and common. It’s a huge thing to make the choice to go out on one’s own, but it’s what people do. It’s a huge risk in many ways, but rewarding as well. They are worthy of our support. To see more small businesses AAH is impressed with and likes to support, check out the We Like page. This is for my friends I graduated from high school with, celebrating our 35th reunion and with whom I cannot be on this occasion. If anything gets broken or if anything questionable happens in the next 24 hours, you can assign it to me. Have a great time tonight. I will be thinking of you and will truly miss you all. As for me, it is remarkable that today, as you prepare to get together over Jeff’s pulled pork and some brews and very changed faces and lives, I am reminded that almost a year ago my father passed away, a moment I still feel today; and that in just two days, my son, Jace will begin his freshman year in high school. Instead of being at the West Vigo Class of ’80 Reunion, I am at the family farm in Kansas this weekend, one last excursion for Jace before school, and recalling that it was while sitting on the front porch of this house just a couple-few years ago that I called and spoke with Robby Cooper, whose father had just passed away. I never knew Rob’s and Roger’s dad, but I read the obituary in the paper and was powerfully compelled to call. We had a nice chat, and though it was entirely unexpected, Rob was gracious and I think we enjoyed our catching up. By all accounts his dad was a remarkable man, and a veteran as I recall. And most of all, it was clear how deeply he was loved and appreciated. He was a man who made a great difference in the world and would be missed immeasurably by his family and friends. Enjoy each others company tonight, and stay in touch. It’s really all we have left, and we don’t really need anything else. It is everything, and it is enough. I think back, I remember how important, how central to our daily lives our music was to us. And now, of course, when we think of it or hear it, we are transported back in a way that nothing else can do. How many of you recall the group Ten Years After? I got to know them as a sophomore. A new guy came to my school, then State High, from Frankfurt, Germany and we became friends. Chris von Slatow was into wind surfing, which I had never heard of until I met him; he was a runner and joined the track team; and he was into music I had never heard of, including Ten Years After. He lived with an elderly couple near Union Hospital who raised springer spaniels; my grandparents had bought their hunting dogs from them many years before. 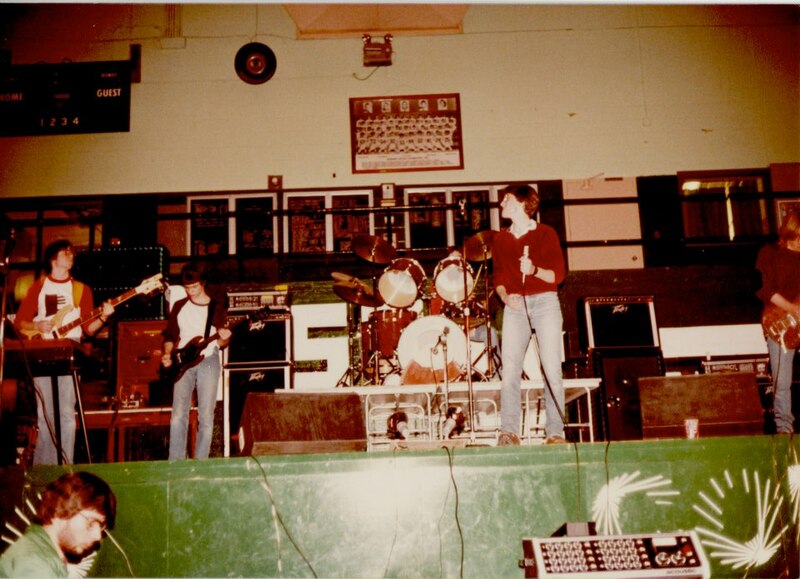 Now we are all 35 years after high school, and while a lot has changed, our memories are fixed. These are just two particular things I remember vividly, and they are memories – among hundreds, I suppose – so many of my classmates and good friends are a part of. In fact, these memories would be nothing without you. I guess distance really does make the heart grow fonder. Summer 1979. We’ve just officially become seniors and Karl and I are driving all over West Terre Haute in his white 1969 Triumph TR6 convertible. We’re smoking Swisher Sweets and listening to this hard-hitting, top-down, post-Lynyrd Skynyrd near-rock anthem. Man, we feel free and light. Our junior year is over. We’ve made it. The sun is bright and the open cockpit is a swirl in the wind and it’s anywhere we want. So we want DQ on National Avenue, then we want to go to South Lake, which requires a cruise through Toad Hop to get there. We park on the west side of the white cinderblock building and saunter into the open-air pavilion, across the cold concrete floor, shaded in the basement of the raised building; we’re in a breeze-way of a concession stand full of neatly aligned green wood picnic tables. We move to the counter to order a follow-up to our DQ visit of just ten minutes before. We each get a huge Coke and keep glancing out, through the open lake-side of the room, to the beach, its coarse gravel pit-quality sand, same as it ever was, just as it was when we were kids. The tall, galvanized slide standing half in and half out of the water is still there, too, as it has always been. And the warm water in its color of weak coffee with a little cream; that too, just as it has always been. We were searching for our friends – mainly girls; probably strictly girls, come to think of it – who have come to get a tan. We are searching when we get there, and searching when we finally leave. Jeez, this is good. And summer has only started. We continue to search through the summer and all the way through our last year of high school and beyond. And life has only started. To read all this and a little bit more in the original, just go Top 5 page, scroll down to the original June and July Top Fives, and look for Rare Earth and Don’t Misunderstand Me.